Not surprisingly, many who saw the ad saw it as playing into the old stereotype of African American men as uncivilized and savage, and presenting Afros as inherently wild and unattractive. I continue to be puzzled that multinational corporations with resources for large-scale marketing campaigns so often stumble in awkward ways when trying to include a range of racial/ethnic groups in their materials. This seems to occur by not sufficiently taking into account existing or historical cultural representations that may provide a background for the interpretation of images or phrases in the advertising. The same can be said here: yes, Nivea (which has pulled the first ad) has a whole ad campaign about “giving a damn” about your looks. Yes, they also had an ad showing a White man, presenting long hair on Whites as unacceptable or unattractive too. But only one of the men is labeled as “uncivilized” when he has “natural” or ungroomed hair. And the cultural context for these two ads isn’t the same. Given the symbolic power of the Afro in the U.S. — because of historical prejudices against African Americans who didn’t have “good hair” or didn’t straighten it (including using the word “nappy” as an insult) and the Afro’s position as a symbol of Black pride and resistance to beauty standards that privilege Whites — presenting an African American man with long, curly hair as “uncivilized” resonates in a way that the White ad simply doesn’t, even if Nivea had used the same language in both ads. With you on the confusion there - why these large companies can't afford to hire marketing folks with an iota of sensitivity to historical stereotypes is beyond me. Often the refrain is, "Oh I'm sure no one thought of it/meant it that way." But the people and agencies hired at these companies have college degrees, usually in marketing, which degree usually requires at least one or two courses in mass media communication, which curriculum almost always includes a portion of material on the power of images and stereotyping, and often a little historical segment as well. 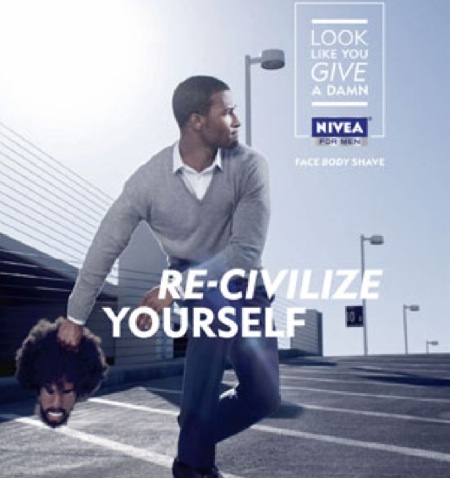 >SIGH< If the two ads had the same text--even the "re-civilize" text--I'd give them a free pass on benefit of doubt. Paraphrasing two different commenters on that forum, I strontly believe that people's values behind their rhetoric are being tested and being culturally competent is fine in theory, but very hard in practice. I believe that those company administrators & staff that have been the focus of those racist ads might agree that racism is bad (or at least believe that they should publicly say that they believe that racism is bad). However, those same people don’t know what constitutes racism except for the most obvious examples of racism such as something like as refusing to serve People of Color in restaurants, calling someone the "n word", and Ku Klux Klan lynching Black men. While those people may believe that racism is bad, they have adopted a color blind (race doesn't matter) stance. And, at the same time, these people continue to view White as the default normal viewpoint and standard of the right ways to look, talk, and do things. Also, at the same time, these people remain largely ignorant of the histories and current conditions of People of Color and don't realize that sometimes race does matter. Sometimes the same things can be interpreted differently-and interpreted negatively- given different histories & different present day conditions. For those people and others it's long pass time to move from racism 101 to advanced courses on cultural competency. This is disgusting, and a prime example of how being race-blind doesn't work. The Afro has strong cultural connotations, and there are still massive problems of racism around POC's hair - like how black women are forced to straighten it lest they appear "ghetto", or how people with dreads get them shaved off in prison for "hygiene" reasons. Really really REALLY not ok to imply that longer hair on a POC is somehow "uncivilized." Not saying this is the case here, but part of the reason why it might seem that major companies continually screw up is because they are big companies. Being a big company means you put out more advertisement, it means you get more attention and, as a big company, you just draw more criticism. No, I don't mean to paint them as victims of vindictive people out to criticize everything they do. However I also think often there are multiple explanations that complement each other. I'm a little surprised that this hasn't been mentioned yet: an Afro is not ungroomed hair. It takes effort to maintain one that looks as decent as the one shown in that ad. The fact that the hair style shown for the African American man is most definitely not a style that is lacking in grooming efforts is part of what makes it so offensive. It illustrates a remarkable ignorance about Black hair. If you haven't seen Good Hair (Chris Rock) yet, you really should. Use a wide toothed comb or pick to comb your hair. It makes it easier to comb if your hair is slightly moist so the comb can slide easier across your hair. Using a leave in conditioner will also make your hair easier to comb. If your hair is very wet, wait until it dries more; hair is most fragile when it is wet. Comb your hair to remove any tangles before brushing it. Using a brush to detangle your hair will stretch your hair and may cause your hair to break off. Hair can get caught on cotton pillow cases and break when you are sleeping, especially if you toss and turn a lot when you sleep. Using a satin or silk pillowcase so that your hair will slide across the pillowcase without getting caught. An alternative to the silk pillowcase is to wear a silk or satin scarf over your hair before your sleep to prevent breakage. So, in the name of sensitivity, black men no longer exist in their advertising. While I do have a feeling that switching the ads would give an offensive effect as well, it would probably be because defining beauty and civilization on your hairstyle is quite a ridiculous concept. I also couldn't help but to notice that the mask on the black man isn't ungroomed - just compare the beards. Political correctness at its worst. People are actually fueling racism instead of working to prevent it. This is a great example of advertisers throwing out a line and everyone taking it, because you know if the "uncivilized" black man didn't do the trick the ungroomed Sin City man that looks like "hell" baring a striking resemblance to Jesus would have. These two ads were begging to be controversial so they could be put under the spotlight, which is exactly what is being done right now. Advertisers win again.